Now that the topic of Lent has been broached a few times, it is too difficult to resist taking a quick glance at the Ash Wednesday-Good Friday Vestment Set waiting to be finished. Intended as a low mass set, two of the major pieces are complete. Pulpit fall completed in time for Good Friday Services. It was a challenge to meet the deadline as the pieces were all hand sewn (with the exception of the rod pocket at the back lower edge), and there were only four weeks after the fabric arrived from the UK to get things finished. It was fun, and very labor intensive. The reason for creating a vestment set completely by hand was to ensure there were no problems with “take up” which often results in a bubbled frontal, and puckered orphreys. Having struggled with problems of puckers and bubbles, ripples and waves on previous project, the goal for this project was to have hangings that – hang well. The final results for both pieces in the black vestment set: they hang without a ripple or bubble. They hang smooth and flat as they are intended. But I will save the construction details for later. After a busy day at the office, it is time to feast the eyes on rich and beautiful fabrics, to get a feel for the “hand” of the fabric, to learn its character, to study the patterns, to learn the possibilities for the features of the motif. Sometimes fabrics sit out for days while checking the pattern motifs, the repeat, and placement for cutting lines. This planning, prior to any cutting, is so important. At this stage, things can change with no harm done. Two Ecclesiastical fabrics are shown in the above photo. 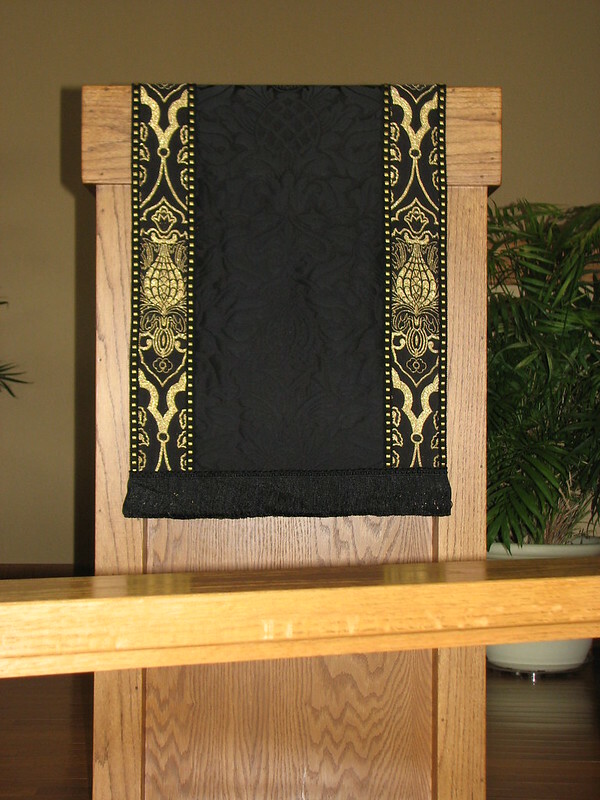 The solid black is an Ecclesiastical Fabric imported from the UK pattern name is Fairford. A Victorian Gothic design with heavy weft effect after the William Morris School. Designed by F.J. Flanagan with inspiration drawn from a portrait of Richard III by an unknown Netherlandish artist circa 1470. For those having never worked with true Ecclesiastical fabrics, it is difficult to describe the difference between these fabrics and the imitations available from the chain discount stores. But let’s start with what this Ecclesiastical fabric it is not. It is not flimsy, it is not slippery, it is not bulky, it is not horrid to work with. It is lovely; it is the right weight, it has the right body, it has an easy to work with pattern repeat. It is very “cut-able,” meaning it can be cut into both large and small vestment pieces without a great deal of waste. And for all of this, it is moderately expensive (depending on your point of view), and well worth the cost. The nature of the design and weave on the Fairford Pattern gives the impression that the fabric is two-toned. That two-toned weave helps the design be visible from a distance. There are two main design motifs in Fariford: a pineapple and an Ogee. The fabric has a very user friendly pattern repeat of 14.5″ vertically as well as horizontally. But that, too, is for another day. Black and gold make a stunning color combination in this Brocatelle fabric named Wakefield, which is available in colors of white/gold, black/gold, two blue/gold options, green/gold and red/gold, and it is imported from the UK. of St. Francis by Domenico Ghirlandio in Santa Trinita Church, Florence. Wakefield has a large pattern repeat – larger than one would expect, based on looking at the above photo. It’s difficult to describe the beauty of this fabric. It is a work of art. The combination of large and small motifs in the same fabric, as well as the contrast in colors make this fabric a great choice for larger spaces. This fabric design, when used as yardage, would be visible from a distance. But this combination of large and small motifs also make this a great fabric for use in other ways, and a little bit can go a long way. With careful planning, the waste will be minimal. And yes, for all of this, it is pricey! And it is worth it. With utility in mind, this fabric design can be cut into orphreys – which is a decorative band of various widths, used to cover seams, or as design elements. Wakefield is special in other ways: it is also designed to be reversible! Select the gold side for shimmer with black accents, or the black side with gold accents. 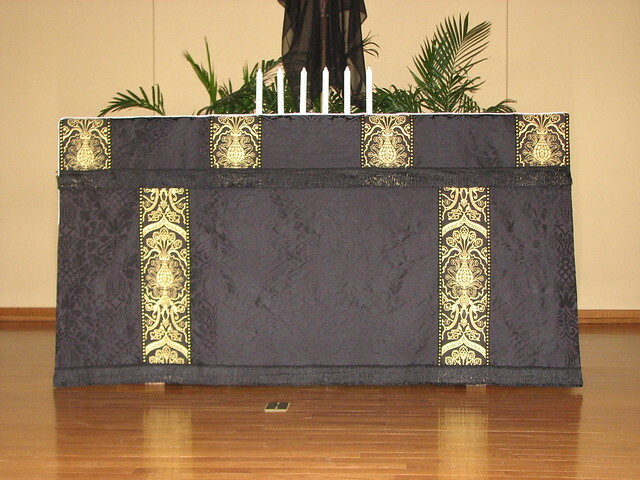 For the Lenten season, I chose the subdued black side with gold accents. After cutting the major pieces for the altar frontal and pulpit fall, the remaining pieces were the perfect size for the chalice veil, and burse. With a little pressing and trimming, those pieces are ready to for the making up. Trim is always a consideration when using orphreys. After looking as many options, the trim selection was finalized with this black/gold dice trim to be used on the edges of the orphrey. There is also a tiny black/gold piping trim that will go around the outer edge on the chalice veil. The only question remaining with regards to the Chalice Veil and a few other pieces is whether to include a black/gold cross on the orphrey of the chalice veil to mark the front. I have managed to acquire a large collection of vintage Ecclesiastical Cross patterns, but none of them seem quite right. If a cross is used, it will have to be a very simple style. And this is the state I am currently in, the things I contemplate. Time to press a few things up from storage over the summer and see exactly where the rest of the Good Friday Vestment Set was left off. It is nice to have an early start on this set for the upcoming season of Lent. After all, there are quite a few pieces to a low mass set.